The power remains out at Farmington Hills but according to DTE status updates, there is a repair truck on site examining the issue. The esitmated repair time remains 11:30pm on September 8th. We will continue to post updates as the status changes. For more information see DTE Outage Map. Please note, the Farmington Hills campus is closed Monday, September 8, 2014 due to the continued power interruption in the area. 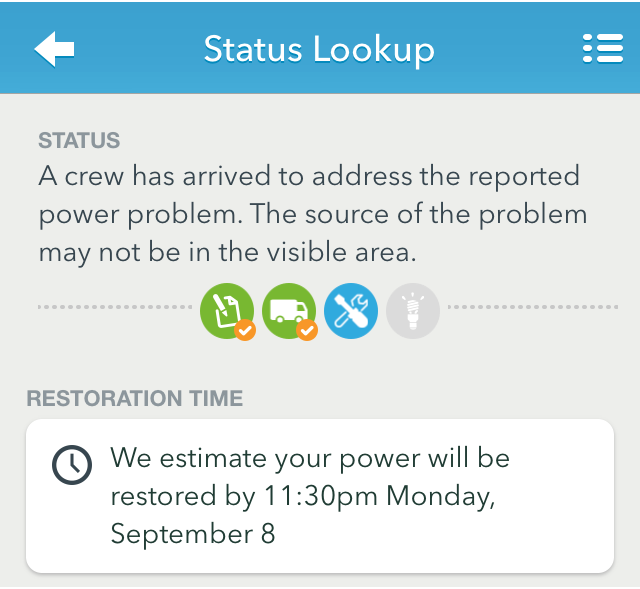 DTE estimates the power will be resotred at 11:30pm on September 8th. In the event that the power is not resotred by Tuesday, Septmeber 9, 2014, Schoolhouse will offer limited childcare at our Canton location (1669 South Haggerty Rd.). To reserve at spot please call our Canton location before 5pm on Spetember 8, 2014 (734.405.2345). We will continue to update the status as more information becomes available.